An employer that provides expenses or benefits to employees or directors must report the relevant details to HMRC. Examples of expenses and benefits include company cars, loans, living accomodation and health insurance. Many benefit types also attract ‘Class 1A National Insurance contributions‘ which are payable by the employer following the end of the tax year. If an employer has provided expenses / benefits during a tax year then they must make an online submisson to HMRC (the ‘P11D(b)‘) which summarises the benefits provided. They must also submit a ‘P11D’ for each applicable employee that has received benefits during that year (unless all of their benefits have been ‘Payrolled’ via the PBIK system, in which case the details will already have been reported to HMRC via RTI returns). These submissions should be made between 6 April and 6 July following the end of the tax year. Payroll Manager is able to calculate the ‘cash equivalent’ value of benefit items such as company cars and loans, and can report these and other benefits online to HMRC via the P11D/PBIK system as appropriate. The benefit values of other items must be manually entered into the system. Payroll Manager also calculates the amount of Class 1A NIC due by the employer. Details of each benefit are entered by clicking ‘Employees‘ then ‘Expenses and Benefits‘ from the main menu in Payroll Manager. Cars – Details of company cars provided are recorded on this screen. Payroll Manager allows for up to 8 cars per employee. See the Car benefits – Data input and Calculation guide for details of how to enter company car information and for an explanation of how Payroll Manager calculates the relevant car benefit amount. Loans – Details of loans provided are recorded on this screen. Payroll Manager allows for up to 2 loans per employee per tax year. See the Loan Benefits – Data Input and Calculation guide for details of how to enter loan information and for an explanation of how Payroll Manager calculates the relevant loan benefit amount. Other – Other expense / benefit items such as Mileage allowance, Private medical treatment, Travelling and subsistence etc are entered on this screen. Note that Payroll Manager does not calculate these amounts automatically and that the relevant amounts should be determined with reference to the various HMRC guides (see links below). Please note that from April 2017 new rules were introduced regarding benefits that have been to provided to employees using ‘Optional Remuneration Arrangements or ‘OpRA’ (e.g. ‘salary sacrifice’). If you have provided benefits using ‘OpRA’ then please refer to section 5 of this guide for more information. If you have registered with HMRC to use the ‘Payrolling Benefits in Kind (PBIK)’ scheme then you must also enter additional data on the ‘Pay Details‘ screen in Payroll Manager. Details of how to do this can be found in our Payrolling Benefits in Kind guide. Note: If you intended to use the PBIK scheme then you will have needed to register to do so with HMRC before the start of the relevant tax year. If an employer has provided expenses / benefits during a tax year then they must submit a ‘P11D(b)’ which summarises the benefits provided. The HMRC deadline for submitting the P11D(b) is 6th July. This submission can be sent electronically through Payroll Manager, or the employer can choose to send a paper copy (using the official form available from HMRC) if they prefer. Unless the employer is using the ‘PBIK’ system (see above), and has chosen to payroll all employee benefits, then the electronic P11D(b) will also include all associated P11d information as part of the same submission. 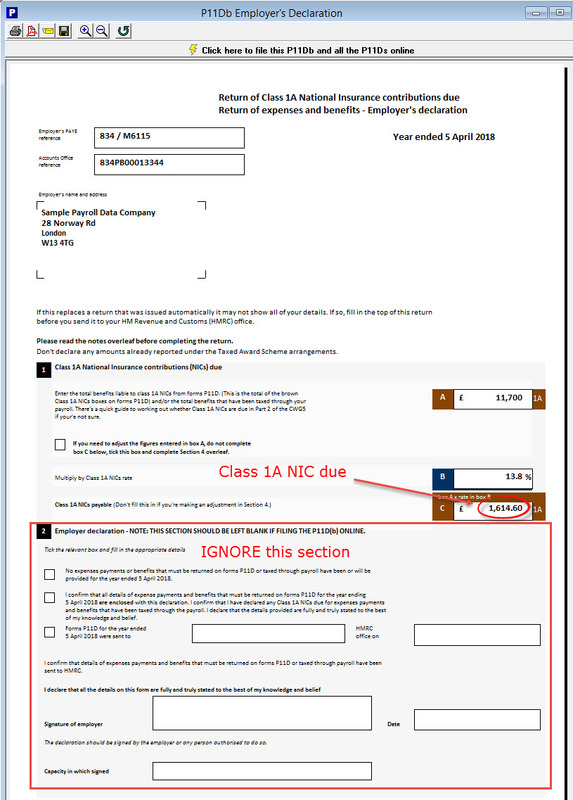 The P11D(b) also shows the amount of Class 1A NIC that should be paid by the employer to HMRC (see more details below). 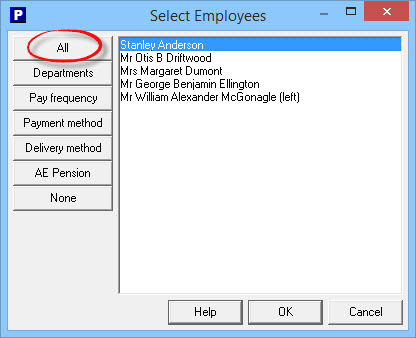 To file the P11D(b) click ‘Forms‘ then ‘Employer’s declaration P11D(b)‘ from the main menu in Payroll Manager. The return can be submitted by clicking on the ‘Click here to file this P11Db and all the P11Ds online‘ bar along the top of the report. You should take particular care to ensure that all details are correct on the P11D(b) and associated P11d forms, as HMRC will not accept corrections to P11D submissions from third party software. Any subsequent corrections must then be made directly on the HMRC website, or via a paper return. Note: The form that Payroll Manager displays on the screen was designed to replicate the information shown on a paper copy of the P11D(b). The actual electronic submission to HMRC is somewhat different from what you see on the screen (and is not designed to be ‘human readable’) which is why we choose to display the ‘paper’ layout. This means that there items on the form such as Part 2 – Employer Declaration which are not sent in the electronic submission and should be ignored when filing online. i.e. it is not possile to ‘tick’ items on the employer declaration section as these do not exist in the electonic submission. Each employee that has had benefits reported via the P11D system should be givene a copy of their P11D by 6 July following the end of the tax year. You can produce and print these forms by clicking ‘Forms‘ then ‘Expenses & Benefits P11D‘ from tha main menu in Payroll Manager. TIP: When selecting employees choose ‘All‘, regardless of whether or not all employees have benefits entered. Payroll Manager will only produce an on screen P11D form for those employees that require one (and will ignore employees with no benefits entered, and those employees whose benefits have all been ‘payrolled’). The P11D can be printed onto plain paper, pre-printed forms, or can be saved as a pdf for issue to the employee. If the benefits for a particular employee have all been ‘Payrolled’, using the PBIK system (details above) then no P11D form will be produced. Instead the employee should be issued with a report detailing their payrolled expenses. Click ‘Forms‘ then ‘Expenses and Benefits Summary‘ to produce this report. Some benefits attract ‘Class 1A NIC’ which is payable by the employer. Payroll Manager automatically calculates the total amount of Class 1A NIC due (if any), and displays this figure on the P11d(b). Not all benefit types are subject to Class 1A NIC. Class 1A NIC is paid to HMRC separately from any other NIC/PAYE payments and must be paid 22nd July following the end of the tax year in order to avoid a penalty. The HMRC guide ‘Pay employers’ Class 1A National Insurance‘ gives details of the various payment methods available. Some employers use Optional Remuneration Arrangements (OpRA) such as ‘Salary Sacrifice’ to provide benefits to their employees. From April 2017 new rules were introduced so that the taxable value of a Benefit in Kind (BIK) is now the higher of the taxable value of that BIK under the ‘normal’ rules and the amount of salary/cash forgone. If you are using OpRA to provide employee benefits then please read Appendix 12 HMRC 480: Expenses and Benefits Guide before completing your P11ds. You only need to inform HMRC that you don’t need to make a return if they have sent you a paper P11D(b), an electronic notice to file a P11D(b) or a reminder letter. If you have not paid any expenses or benefits to employees and have not received anything from HMRC asking you to file a return then you do not need to file a P11D(b) at all. You can file a ‘Nil P11d(b) from Payroll Manager by clicking ‘Forms – Employers declaration P11d(b)’ from the main menu. You should double check that you have no expenses or benefits entered before doing do. Alternately you can use either the employer or agent online form provided by HMRC on the following link.